DAGNEAU DOUVILLE DE QUINDRE, LOUIS-CÉSAIRE, merchant, militia colonel; baptized 8 Oct. 1704 at Sorel (Que. ), son of Michel Dagneau Douville and Marie Lamy; m. Françoise-Marie-Anne Picoté de Belestre in Montreal, 4 Dec. 1736; buried at Detroit 2 Feb. 1767. As early as 1727 Louis-Césaire Dagneau Douville de Quindre was trading among the Miamis. The late 1730s found him sending canoes to Michilimackinac and, in partnership with Claude Marin de La Perrière, leasing the lucrative Michipicoton post (near Michipicoten Harbour, Ont.) from Pierre Gaultier de Varennes et de La Vérendrye. 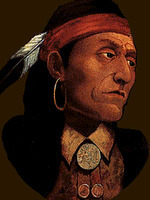 Between 1740 and 1742 he moved his wife and children from Montreal to Fort Saint-Joseph (probably Niles, Mich.) and there, with his partner Marin, carried on an extensive trade with the Miamis and Potawatomis. The two associates transferred their operations to Michilimackinac in 1747 and became leading suppliers for the garrison at that strategic point. It was an uneasy year for the French posts as almost every Indian band in the west threatened and plotted their destruction, and de Quindre sent his wife back to the safety of Montreal. At Detroit there was open insurrection led by Orontony, but at Michilimackinac prompt, forceful action by the commandant, Jacques Legardeur de Saint-Pierre, kept the peace with the neighbouring Ojibwas and Ottawas. Probably in the early summer of 1749 de Quindre moved to Detroit, where settlement was being encouraged and the post reinforced. According to Mme Bégon [Rocbert] the family was in financial difficulties and Mme de Quindre, now without resources, was obliged to leave Montreal to rejoin her husband. He began trading and became a major supplier to the Detroit garrison. In the next few years he provided it with many canoes, much clothing, and huge supplies of grain. 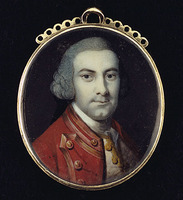 The relationship he developed with the commandant, Pierre-Joseph Céloron de Blainville, probably led Céloron to arrange in 1752 for Île aux Cochons (Belle Isle) in the Detroit River to be ceded to him. Residents of Detroit, however, protested successfully, claiming that the island had always been common grazing ground. In 1753 the commandant was able to reward him with the largest of 12 land grants made on the west side of town. After the peace de Quindre adjusted to English rule and did not assist the Indians during Pontiac’s uprising of 1763. He is said to have aided the English cause, but evidence is slim. At his death in 1767, he was one of the settlement’s wealthiest residents, with an estate valued at 5,000 livres. Although Detroit is often considered to have been a crude frontier community, the inventory of his goods indicates that he lived in considerable comfort. He was survived by several children, one of whom, Guillaume-François Dagneau de Quindre de La Picanier, is said to have become an officer in the British army. AN, Col., C11A, 117, f.3; 118, f.142; 119, ff.236, 304v. ANQ, NF, Registres d’intendance, X. DPL, Burton hist. coll., Christian Denissen, [Genealogy of French families of Detroit] (26v., typescript, n.d.), D/1, 3288–89. St Ann’s Parish (Mackinac Island, Mich.), Registre des baptêmes, mariages et sépultures de Sainte-Anne-de-Michillimakinak, 1695–1821; an annotated version under the title “The Mackinac register” is in Wis. State Hist. Soc. Coll., XVIII (1908), 469–513; XIX (1910), 1–149, but it contains some inaccuracies. “The British regime in Wisconsin – 1760–1800,” ed. R. G. Thwaites, Wis. State Hist. Soc. Coll., XVIII (1908), 229–34. “Correspondance de Mme Bégon” (Bonnault), APQ Rapport, 1934–35, 68. Johnson papers (Sullivan et al. ), XIII, 115, 251. “Petition of sundry inhabitants of Detroit,” Michigan Pioneer Coll., X (1886), 237. “The St. Joseph baptismal register,” ed. George Paré and M. M. Quaife, Mississippi Valley Hist. Rev., XIII (1926–27), 201–39. Massicotte, “Répertoire des engagements pour l’Ouest,” APQ Rapport, 1929–30; 1930–31. Tanguay, Dictionnaire. Champagne, Les La Vérendrye. Silas Farmer, The history of Detroit and Michigan . . . (Detroit, 1884), 20. M. C. W. Hamlin, Legends of le Détroit (Detroit, 1884), 290–91. Télesphore St-Pierre, Histoire des Canadiens du Michigan et du comté d’Essex, Ontario (Montréal, 1895), 178. Donald Chaput, “DAGNEAU DOUVILLE DE QUINDRE, LOUIS-CÉSAIRE,” in Dictionary of Canadian Biography, vol. 3, University of Toronto/Université Laval, 2003–, accessed April 22, 2019, http://www.biographi.ca/en/bio/dagneau_douville_de_quindre_louis_cesaire_3E.html.